Acquired from the artist by Eugénie Kupka; Mr. and Mrs. Jan Mladek, Washington, D.C., by 1965; acquired 1984 by NGA through gift and purchase. Frantisek Kupka - The Meda Mladek Collection, Akademiehof, Vienna, September-November 1996, no cat. Frantisek Kupka ze sbírky Jana a Medy Mládkovych ve Washingtonu, The Czech Museum of Fine Arts, Prague, May-August 1996, no. 122, repro. Painting the Universe: Frantisek Kupka, Pioneer in Abstraction, Dallas Museum of Art; Kunstmuseum Wolfsburg, Germany; Národní galerie v Praze/Sbírka moderního a soucasného umeni [National Gal. in Prague, Coll. of Mod. Art], Prague, 1997-1998, no. 112. 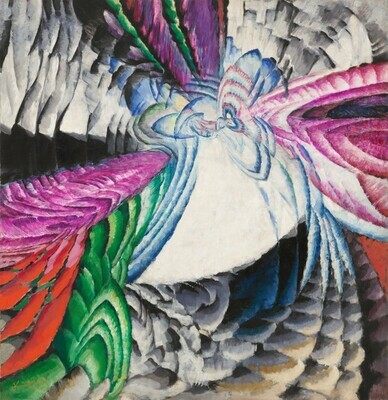 Kupka: Localización de móviles gráficos 1912-1913, Fundación Colección Thyssen-Bornemisza, Madrid, 1998-1999, no. 16, repro. Aux origines de l'abstraction, 1800-1914, Musée d'Orsay, Paris, 2003-2004, no. 118, repro. Visual Music, The Museum of Contemporary Art, Los Angeles; Hirshhorn Museum and Sculpture Garden, Washington, D.C., 2005, unnumbered catalogue, repro. Inventing Abstraction, 1910-1925. How a Radical Idea Changed Modern Art., The Museum of Modern Art, New York, 2012 - 2013, unnumbered catalogue. European Paintings: An Illustrated Catalogue. National Gallery of Art, Washington, 1985: 218, repro. Andel, Jaroslav and Dorothy Kosinski. Painting the Universe: Frantisek Kupka, Pioneer in Abstraction, Exh. cat., Dallas Museum of Art, Kunstmuseum Wolfsburg, National Gallery in Prague, 1997-1998, no. 112, repro. Kirsh, Andrea, and Rustin S. Levenson. Seeing Through Paintings: Physical Examination in Art Historical Studies. Materials and Meaning in the Fine Arts 1. New Haven, 2000: 264.